My friend Øyvind Hansen gave me this Swiss wine, bought on a ski vacation. It tasted very different from other white wines I have ever tasted. 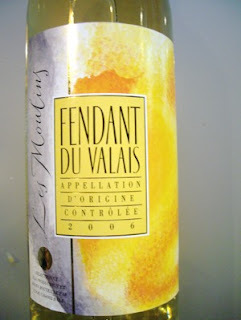 It is produced in the Canton Valais in Switzerland, situated in the south of the country bordering Italy and France. It is produced from the fendant or chasselais grape, the oldest grape variety known, cultivated for 5500 years, and originating from Egypt. Actually this wine was different from other white wines I have tasted. Very dry and fresh, with a distinct flower aroma. The producer recommends it to fried fish and chicken, pasta and cheese.